The White Sox lost but, once again, the Tigers couldn't capitalize and gain any ground. The always-tough KC Royals beat Chicago 7-5. The score was posted for all to see at Angel Stadium. 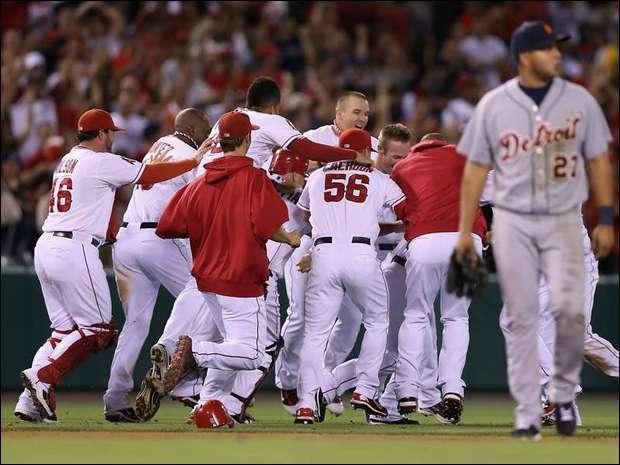 Like usual, Max Scherzer was outstanding - 8 innings pitched, 5 hits, 2 runs, no walks and 9 Ks. A master of the strike zone. On the Angels side, Ervin Santana didn't last as long, but dominated the Detroit batting order - 6 2/3 innings, 4 hits, 2 runs, 1 walk and 10 Ks. Prince Fielder and Alex Avila went deep for Detroit. Torii Hunter and Howie Kendrick drove in first-inning runs for the Angels. The game was tied 2-2 until the bottom of the 9th. With 2 outs, pinch-hitter Alberto Callaspo drove home pinch-runner Peter Bourjos to give the Angels a 3-2 victory over the Tigers. 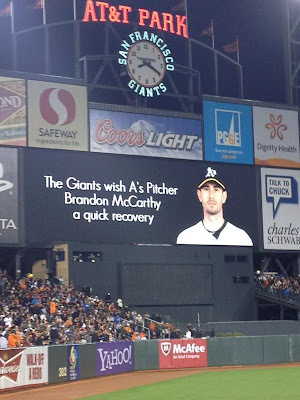 With Brandon McCarthy lying in a Bay Area hospital, recovering from brain surgery, the Oakland A's faced a daunting task - winning this game for their fallen comrade. To do it they had to overcome the opposing pitcher - 'King' Felix Hernandez. The Athletics chased 'King' Felix after 4 2/3 innings. They torched him for 11 hits and 6 runs. 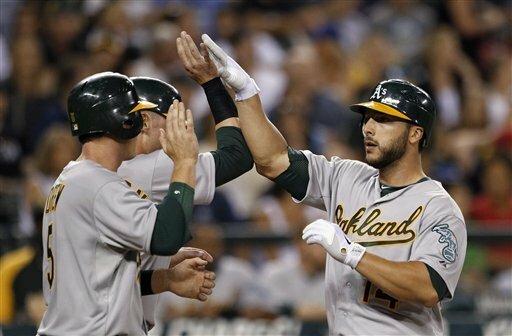 A's catcher George Kottaras hit a 3-run homer and second baseman Cliff Pennington went 4-for-4 as the Athletics beat the Mariners 6-1. The A's trail Texas by 4 1/2 games in the AL West. Oakland, New York and Baltimore are all within a half-game of each other on top of the wild card standings. 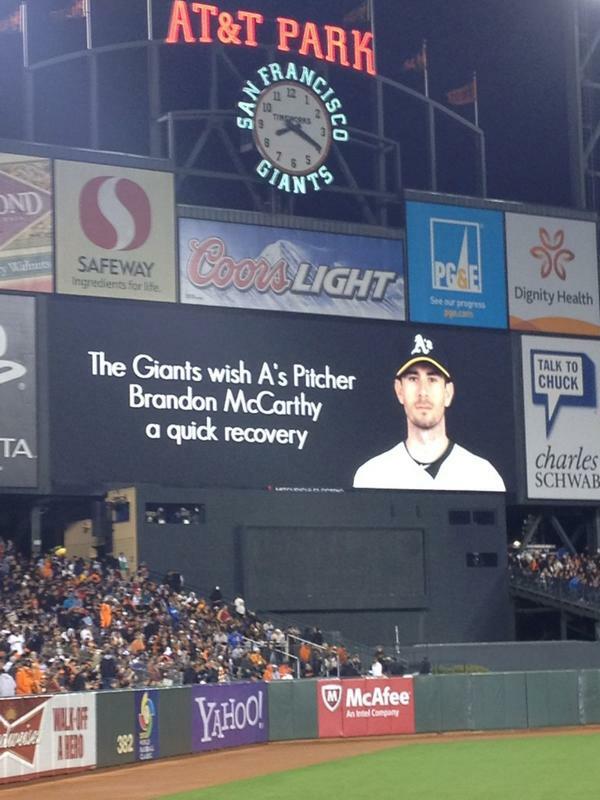 The San Francisco Giants put this up on their scoreboard during their game against the Dodgers on Friday night. RAINY IN CHICAGO. SUNNY IN WINDSOR. TIGERS IN FIRST - HAPPY LABOUR DAY!